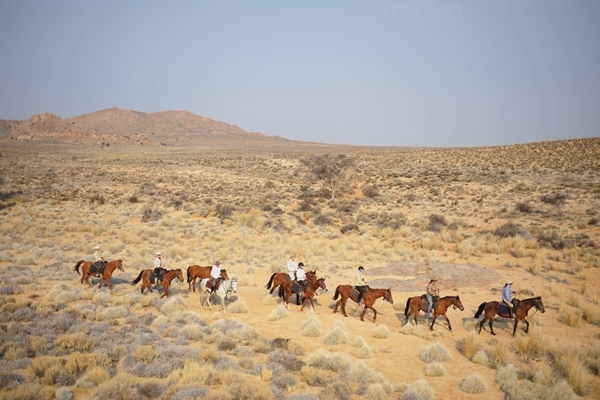 How about a week-long riding holiday in Namibia alongside some of Africa’s finest riding safari guides? 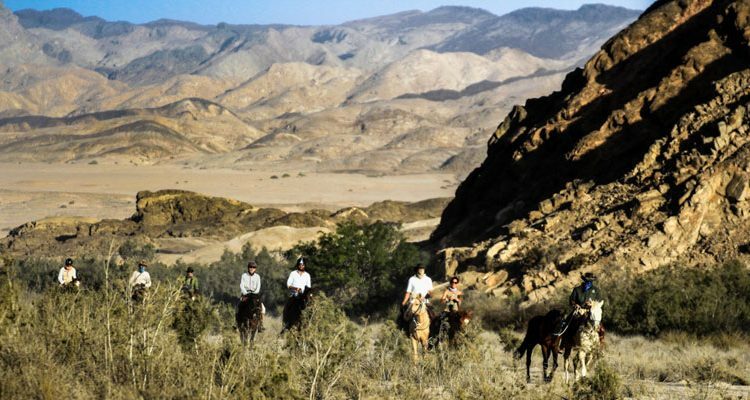 Namibia Guide Ride is a unique opportunity to cross one of the most scenic deserts on the planet in the company of some of Africa’s finest riding safari guides. 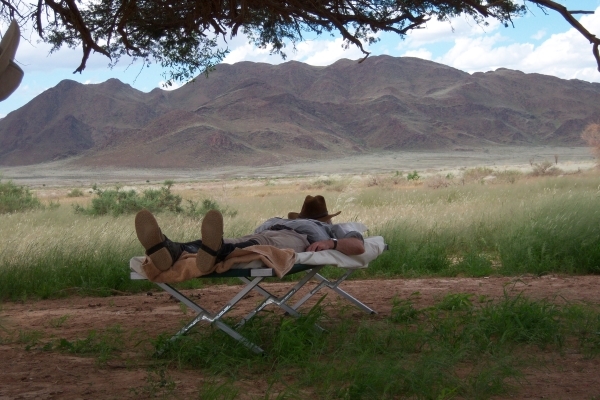 Travelling through Namibia’s rugged and remote Namib Desert is not for the faint-hearted, and it’s a challenging ride, but for those with an adventurous spirit this seemingly inhospitable ‘wasteland’ holds many wonderful surprises. 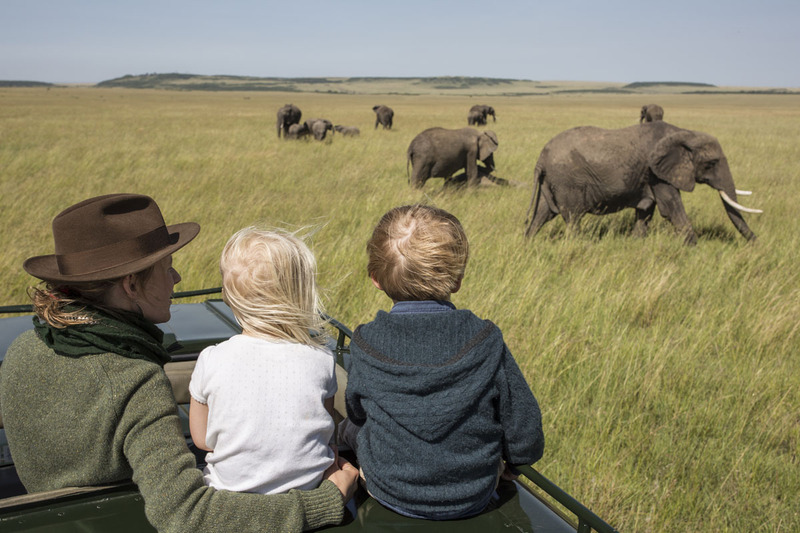 The riding guides joining you are Michael and Nicky Dyer from Borana Lodge Riding, Jo Westermark from Kaskazi Riding Safaris, Philip and Gerti Kusseler from Wait A Little Horse Safaris and Chase Jordaan from Ant’s Hill and Ant’s Nest Riding. 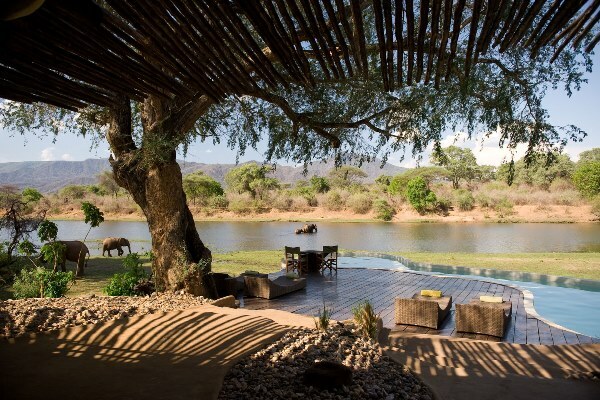 You will be collected off your flight and transferred to River Crossing Lodge where you will meet the rest of the group for sundowners. Your riding guide, Andrew Gillies, will explain how to survive the rigours of riding in a true desert. An early departure by road takes you to the starting point of the ride via an impressive drop off the escarpment with the desert dramatically spread out to the horizon. 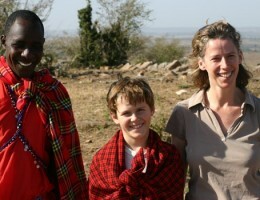 Lunch on the way and arrive in camp this afternoon in time to meet the crew and your horse. 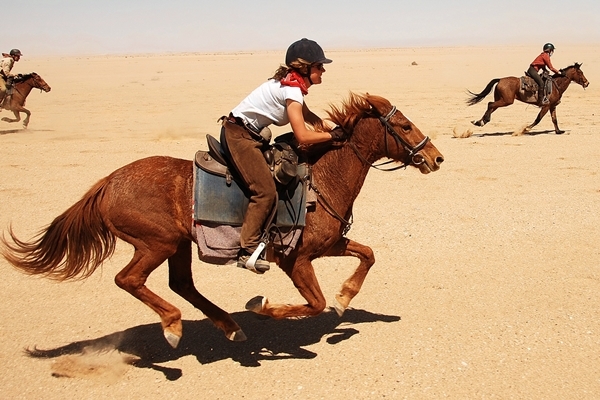 Good going affords some fast-paced riding on the wide plains on the Namib. Dry watercourses, distinguishable by the long lines of acacia trees marking their routes are much favoured resting places of giraffe, springbok and oryx. As the plains become more arid, strange shapes form and disappear in mirages and dinosaur-like plants, the gnarled Welwitschia Mirabilis, tell of a land of great antiquity and also of tremendous solitude. The Swakop river basin has a truly ancient geology – some 600 million years old – exposing a bizarre moon-like landscape. The final ride today follows the Swakop River bed as it meanders to the ocean, coming upon some of this desert’s iconic dunes on the way. 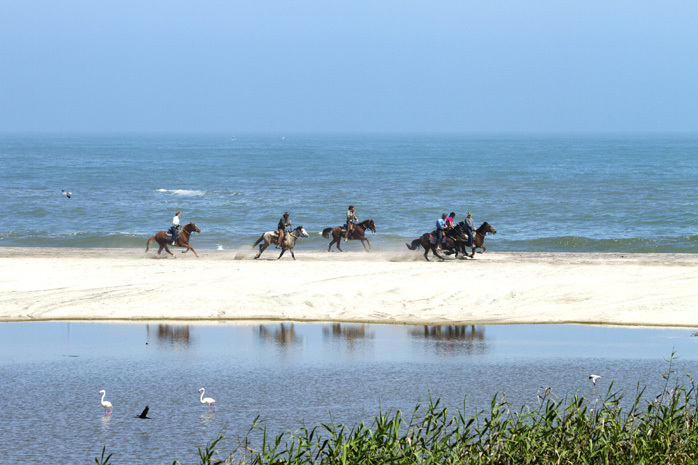 Finally, there’s a last canter along the beach after which you will find it hard to leave your horse and this extraordinary landscape at the end of this unforgettable adventure. Today you will transfer back to Windhoek (if you are extending your stay) or to Windhoek International Airport for your onward international flights departing after 15:00. 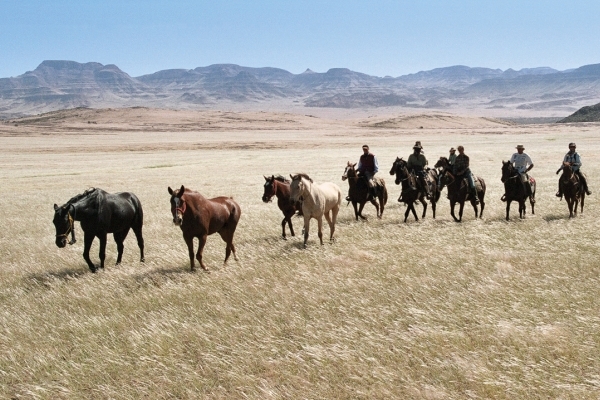 After an early breakfast you can expect to leave camp each morning at around 8 am with four to five hours’ riding before lunch. Lunch breaks are around two hours followed by another two to three hours’ riding in the afternoon. 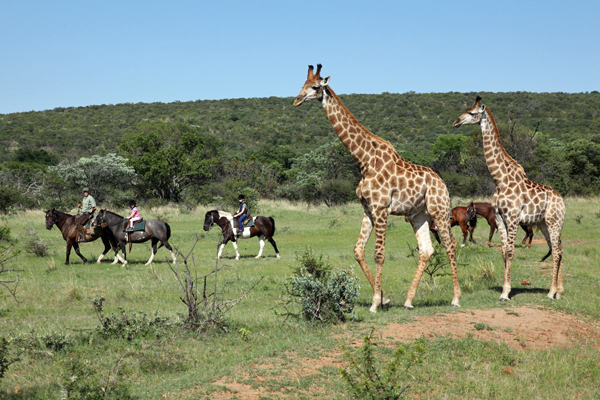 The ride averages 20 to 50km per day, at all paces and sometimes over rough terrain. It’s essential that you are an experienced rider, capable at all paces. 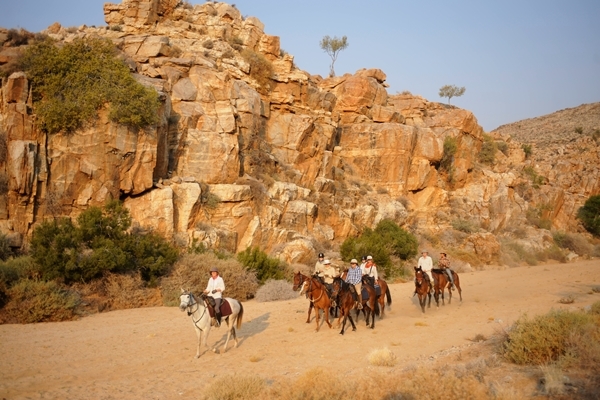 From Windhoek back to Windhoek: 8 days, 7 nights, 5 riding days; 2 accommodated nights at the lodge (first and last), 5 nights camping ‘wild’. The price is £4000 per person. I would like more details. When is deposit due or full amount.